Theresa May's Brexit authority has taken a huge hit after MPs backed moves to take back control of the process from the Government. MPs endorsed Sir Oliver Letwin's cross-party Brexit plan by 329 votes to 302, inflicting a defeat on the government, before passing the later motion to confirm it as Parliamentary business by 327 votes to 300. The success of the Letwin amendment thus paves the way for a series of "indicative votes" in the Commons on Wednesday. 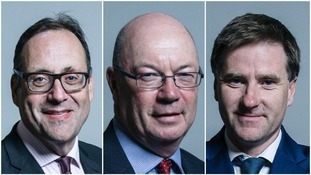 The rebellion against the Government was helped by the resignations of Foreign Office Minister Alistair Burt, pro-EU business minister Richard Harrington and health minister Steve Brine. MPs have voted to take back control of the Brexit process, so what happens now? ITV News Political Editor Robert Peston declared the PM's Brexit authority "in tatters" after the amendment result as he reacted to a tumultuous night in the Commons. Labour leader Jeremy Corbyn welcomed the Letwin amendment result, saying: "I would like to congratulate the House for taking control. “The Government’s approach has been an abject failure and this House must now find a solution." He added: “The Government must take this process seriously. We do not know what the House will decide on Wednesday. But I know there are many members of this House who have been working for alternative solutions, and we must debate those to find a consensus. Mrs May earlier made clear she would not feel bound by the result of any indicative votes – which could include a “softer” Norway-style deal, or a second referendum. "No Government could give a blank cheque to commit to an outcome without knowing what it is,” she said. Speaking after Mrs May's crushing defeat, Health Secretary Matt Hancock called on MPs to back the Prime Minister's Brexit deal when and if it comes back to the Commons. "The best way through this is the Prime Minister's deal," Mr Hancock said, as it "delivers on the result of the referendum, but does so in a way that protects the economy". The 40-year-old continued that as the UK edges closer to Brexit, "options increasingly get taken out of the picture by Parliament, that focuses on the real choice that people have got. "Whether people like it or not, no-deal is now not going to be supported by Parliament." The West Suffolk MP said Parliament would not support no-deal due to the findings of research and prepararion done on it. "So anybody who supports delivering on the results of the referendum should vote for the deal, and I hope the Prime Minister will bring it back as soon as she knows she's got the votes to get it through." However, chairman of the hard-Brexit European Reseach Group, Jacob Rees-Mogg tweeted that "the choice seems to be Mrs May's deal or no Brexit". The Letwin result is another humiliation for Mrs May, who earlier warned MPs not to “overturn the balance of our democratic institutions” which means the Government normally controls business of the House. The amendment result came after she ruled out a third vote on her Brexit deal on Tuesday. The prime minister earlier confirmed she still doesn't have enough support for a third meaningful vote after the DUP told ITV News: "Nothing has changed." Reacting to the Letwin amendment result, a spokesperson for the Department of exiting the EU said: "It is disappointing to see this amendment pass, as the Government made a clear commitment to provide a process to find a majority in Parliament for a way forward this week. Mr Harrington, a Business Minister, accused the the Government of “playing roulette” with the lives and livelihoods of the people of Britain in its handling of Brexit. There was a crumb of comfort for the government as Labour MP Margaret Beckett's rebel amendment - which pushed for steps to protect against a no deal Brexit - was narrowly defeated by 314 votes to 311. The Beckett amendment sought to make the Government move a motion on whether the Commons approves the UK leaving without a deal and on whether there should be an extension to Article 50 if Britain comes within seven days of crashing out.